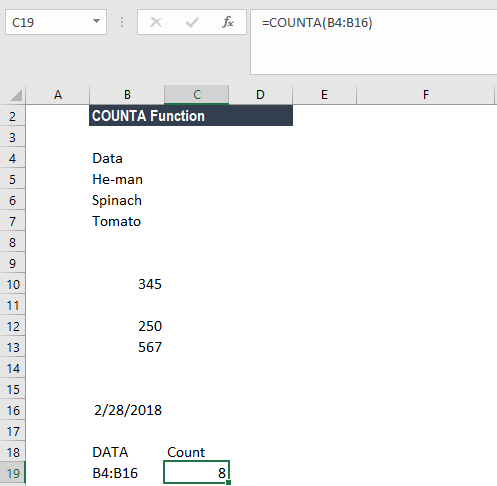 What is COUNTA (Excel Countif Not Blank)? The COUNTA Function is categorized under Statistical functionsFunctionsList of the most important Excel functions for financial analysts. This cheat sheet covers 100s of functions that are critical to know as an Excel analyst and will calculate the number of cells that are not blank within a given set of values. 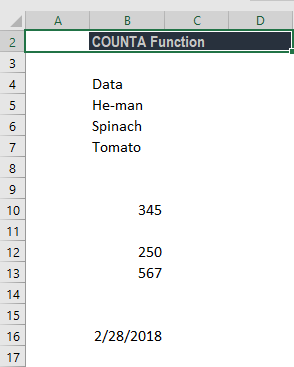 The COUNTA function is also commonly referred to as the Excel COUNTIF Not Blank formula. As a financial analystAnalysis of Financial StatementsHow to perform Analysis of Financial Statements. This guide will teach you to perform financial statement analysis of the income statement, balance sheet, and cash flow statement including margins, ratios, growth, liquiditiy, leverage, rates of return and profitability. 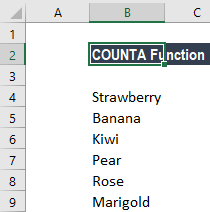 See examples and step-by-step instruction, the COUNTA function is useful if we wish to keep a count of cells in a given range. Apart from crunching numbers, we often need to count cells with values. In such scenario, the function can be useful. Value1 (required argument) – It is the value at which we evaluate the function. Value2 (optional argument) – Additional arguments that represent the values that we wish to count. We can enter up to 255 value arguments if we are using MS Excel 2007 or later. Earlier versions can handle 30 arguments only. Value arguments can be values, array of values or references to cell ranges. 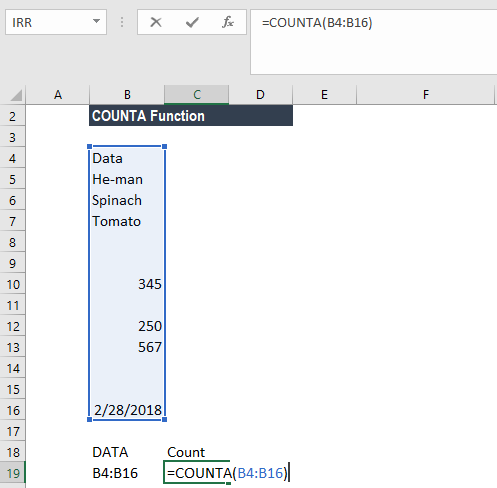 How to use the COUNTA Function in Excel? 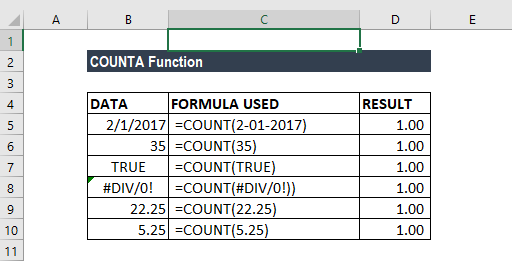 As seen above, the COUNTA function will count text or formula errors. So unlike the COUNT function, which considers only numbers, COUNTA considers numbers, dates, text values, logical values, and errors). To count the cells with data, we will use the formula =COUNTA(B4:B16). We get 8 as the result, as the COUNTA function will not count cells that are absolutely empty cells. Suppose we wish to count cells that are not equal to a range of certain things. We can use a combination of the COUNTA, COUNTIF and SUMPRODUCT functions to get the desired results. We can list down the things we wish to exclude from counting. One other way to arrive at the same result is to use the formula =COUNTIFS(B4:B9,”<>Rose”B4:B9,”<>Marigold”). However, the above formula would be tedious to use if the list contains many items. We need to add an additional range/criteria pair for each item that we don’t wish to count. 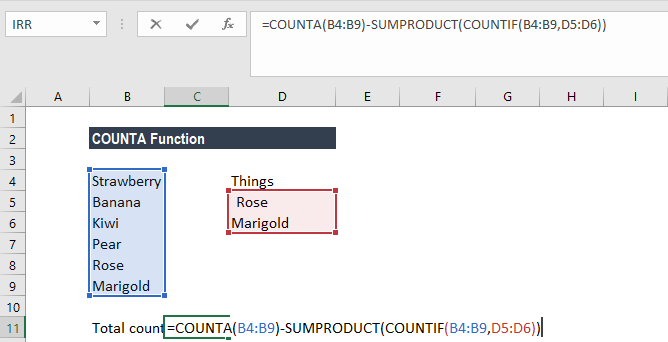 Hence, we can use a reference list and use the =COUNTA(B4:B9)-SUMPRODUCT(COUNTIF(B4:B9,D5:D6)) formula. The formula uses the range D5:D6 to hold values that we don’t want to count. 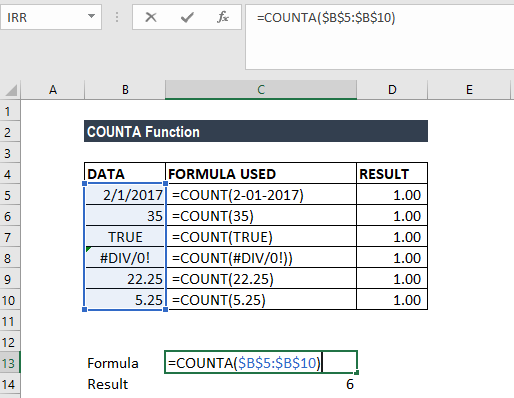 The formula starts by counting all values in the range being counted with COUNTA. Next, it generates a count of all things we don’t want to count with COUNTIF. Lastly, SUMPRODUCT will sum up all items in the array, which returns 2. The number is then subtracted from the original total to yield the final result. If we wish to count logical values, we should use the COUNTA function, but if we want to count only cells that contain a number, we should use COUNT function. The function belongs to the COUNT function family. There are five variants of COUNT functions: COUNT, COUNTA, COUNTBLANK, COUNTIF, and COUNTIFS. 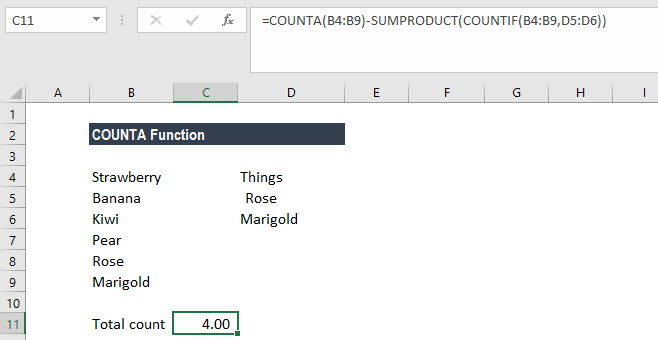 We need to use the COUNTIF function or COUNTIFS function if we want to count only numbers that meet the specific criteria. If we wish to count based on certain criteria, we should use COUNTIF.